After 25 years of partnership, Southwest Airlines has announced that it's parting ways with SeaWorld Entertainment, Inc., after the company faced intense backlash from animal rights advocates. According to AP, officials at both companies said that the decision was mutual and the partnership wouldn't be renewed at the year's end. The move comes after a petition calling on the airline to drop SeaWorld, with whom they offered travel packages and deals, gained over 30,000 signatures. Activists cited the film "Blackfish," which exposed animal abuse at the park, saying that Southwest was promoting cetacean captivity by continuing their partnership. Conservationists are already celebrating the announcement as a major victory for animals. "Whenever somebody claims that petition don't make a difference - don't listen to them," Louie Psihoyos, Executive Director of the Oceanic Preservation Society (OPS), told The Dodo. "The smallest act, pushing a button to sign a petition may not at first seem to cause a ripple but united together we can create waves of change." Candace Crespi, Campaign Director for OPS added that now animal advocates won't have qualms with flying Southwest anymore. 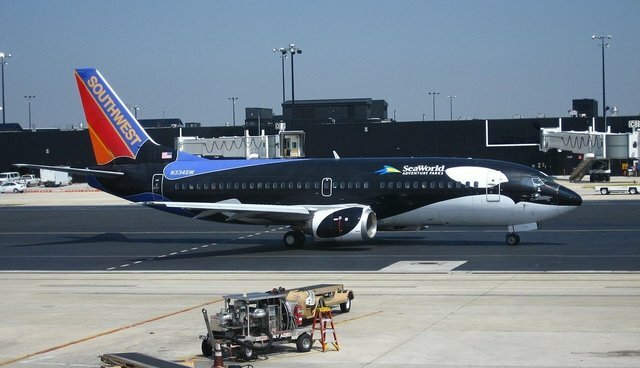 "We're thrilled to hear of Southwest's decision to end its partnership with SeaWorld," she said. "We commend your decision to take corporate responsibility and not endorse those exploiting animals. We look forward to flying with you once again!" According to a statement on the company's website, Southwest's three specialty airplanes painted to resemble orca whales will return to the company's traditional livery.